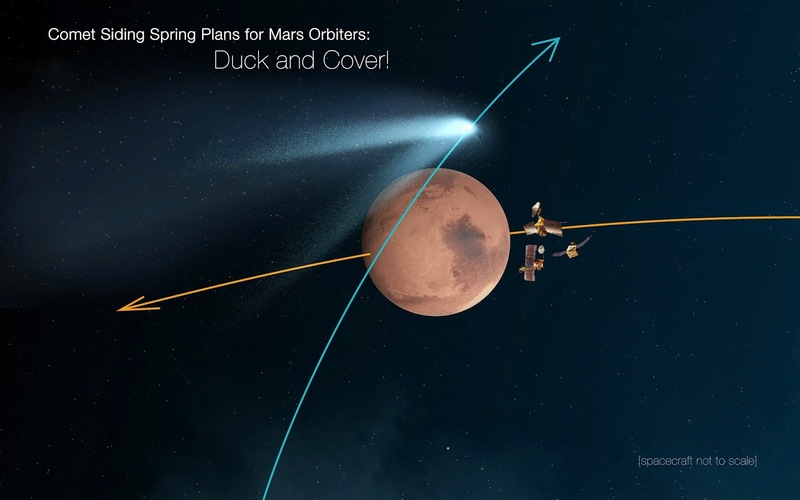 This artist's concept shows NASA's Mars orbiters lining up behind the Red Planet for their "duck and cover" maneuver to shield them from comet dust that may result from the close flyby of comet Siding Spring (C/2013 A1) on October 19, 2014. The comet's nucleus will miss Mars by about 87,000 miles (139,500 kilometers), shedding material as it hurtles by at about 126,000 miles per hour miles (56 kilometers per second), relative to Mars and Mars-orbiting spacecraft. NASA is taking steps to protect its Mars orbiters, while preserving opportunities to gather valuable scientific data. The NASA orbiters at Mars are Mars Reconnaissance Orbiter, Mars Odyssey and MAVEN. Note: For more information, see PIA18612: View of Comet Siding Spring from Southern Hemisphere (Artist's Concept) and NASA Prepares its Science Fleet for October 19 Mars Comet Encounter.